Come and enjoy an afternoon of breaking bread with fellow knowledge seekers, justice fighters, and social champions. 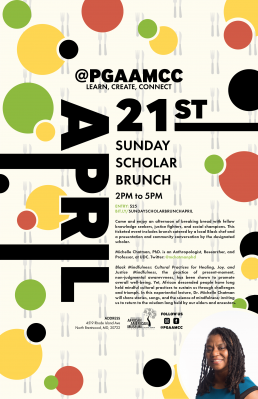 This ticketed event includes brunch catered by a local Black chef and a presentation and community conversation by the designated scholar. April's Scholar is Anthropologist, Researcher, and Professor, Michelle Chatman PhD! Dr. Chatman's lecture will explore Black Mindfulness: Cultural Practices for Healing, Joy, and Justice. Mindfulness, the practice of present-moment, non-judgmental awareness, has been shown to promote overall well-being. Yet, African descended people have long held mindful cultural practices to sustain us through challenges and triumph. In this experiential lecture, Dr. Michelle Chatman will share stories, songs, and the science of mindfulness; inviting us to return to the wisdom long held by our elders and ancestors. Dr. Michelle Chatman is an Assistant Professor in the Crime, Justice, and Security Studies program at The University of the District of Columbia, where she integrates mindfulness and contemplative approaches into her instruction and leads the university’s mindfulness Initiative. Dr. Chatman is Research Fellow in the RWJF Interdisciplinary Research Leaders (IRL) Program. With her research team, she will be piloting a mindfulness and restorative-justice based violence prevention initiative for DC youth. In her compelling TEDx talk, Dr. Chatman links her contemplative work to her volunteerism in The Gambia, West Africa (link below). Though a native Washingtonian, Dr. Chatman now resides in Prince George's county with her husband and daughter.